Many movie theaters are using Alpha and AlphaVision signs to display show times and to direct patrons to the appropriate movie hall. This case study describes how displaying up-to-the-minute show times and directional information on Alpha signs improves ticket and concession sales, reduces labor costs changing signs, reduces the need for ushers, improves employee morale, improves customer satisfaction, and gives a modern appearance to the theater. Box Office Signs: Two AlphaVision signs list all movie titles, movie ratings, and show times. 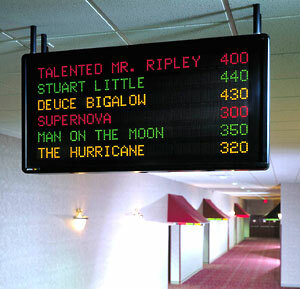 Directional Signs: Two AlphaVision signs list movie titles and show times for movies down the hall. House Signs: Ten one-line Alpha signs are mounted on the ceiling perpendicular to auditorium doors and display movie titles and show times for each auditorium. 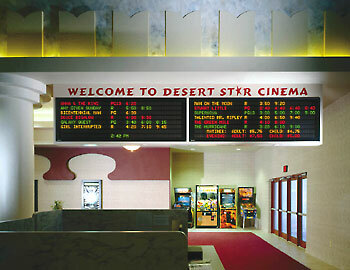 The signs can be viewed from some distance down the hallway, directing customers to the correct auditorium. Between movies, the House signs display concession advertising, “Closed for Cleaning” type messages, and other anouncements. Raises comfort level because of excellent support - Sklenar added, “Now, long after the sale has been made, the service continues... You just don’t find employees that take such pride in their work every day. This made a lasting impression on me!”.